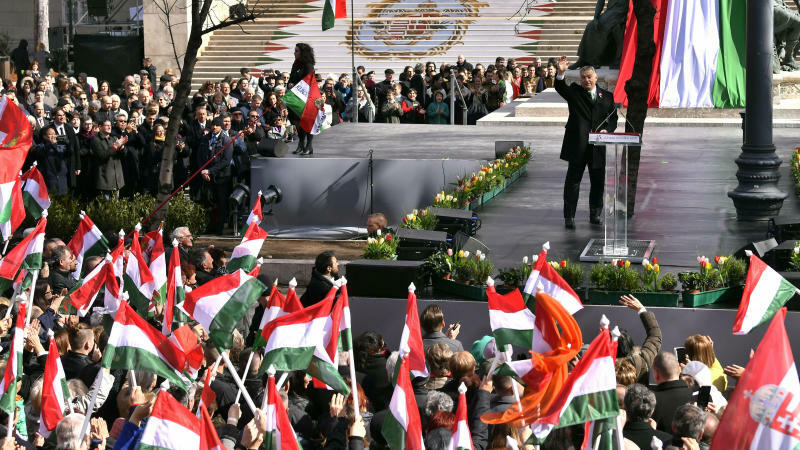 BUDAPEST, Hungary (AP) — Hungarians want strong new leaders for Europe and a "fresh start" to halt the continent's decline amid Muslim immigration, Hungary's populist prime minister said Friday as he looked ahead to May's European Parliament elections. 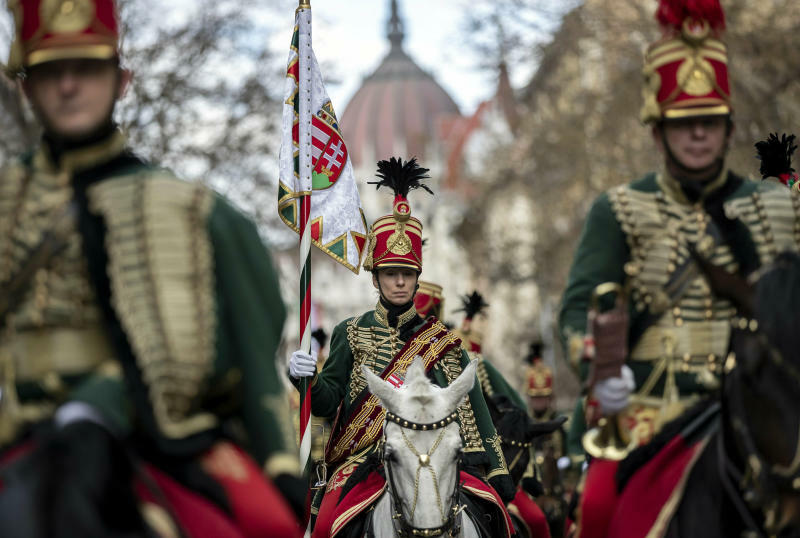 "We're the ones who want a strong Europe, strong nation-states and strong new leaders at Europe's fore," Viktor Orban told a crowd gathered at the National Museum for commemorations of Hungary's 1848 revolution against the Habsburgs. "We want a fresh start to stop Europe's decline, to put an end to the fever dreams about a United States of Europe and to let Europe again belong to the Europeans." Orban also took pride his country's role in stopping "the migrant invasion" of the continent, when Hungary built fences on its southern borders in late 2015 to divert the migrant flow. "We wish for the veil to fall from the eyes of the people of Europe, so they can see and understand that without Christian culture there will be no free life in Europe," said Orban, who sees Muslim immigrants as threats to Europe's lifestyle. "Without defending our Christian culture, we will lose Europe and Europe will no longer belong to Europeans." On Wednesday, Europe's main center-right group, the European People's Party, will debate the possible suspension or expulsion of Orban's ruling Fidesz party, requested for now by 13 of the EPP's 49 parties. 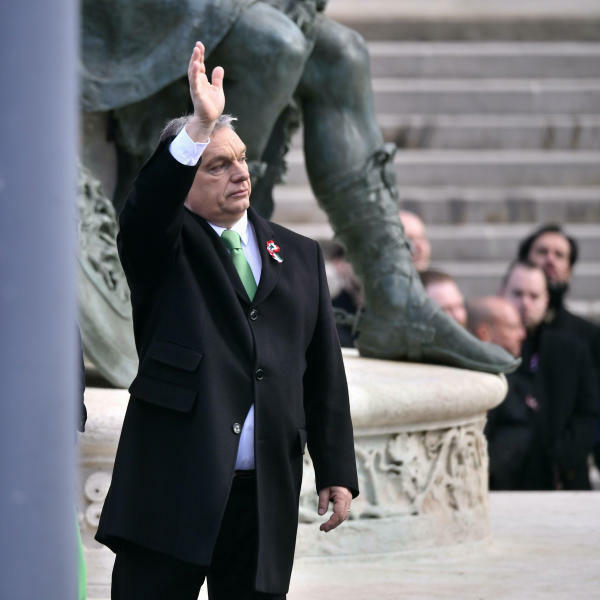 After years of quarrels, some EPP members say Orban — who returned to power in 2010 and has become a role model for Europe's far-right for his anti-immigration, anti-European Union rhetoric and autocratic style — has strayed too far from Christian Democratic values. Polish Prime Minister Mateusz Morawiecki also spoke at Friday's commemoration, highlighting centuries of Polish-Hungarian friendship. Orban said last week that he would seek to form an alliance with Poland's ruling Law and Justice party, helmed by his ally Jaroslaw Kaczynski, if Fidesz is ousted from the EPP.